1. Erroll, please be sure to get the transportation receipts from the men; by this, I don’t mean their little cab bills…—I mean their travel tickets, after used. 2. You didn’t send me any personal receipts in the envelope I gave you. 3. Did you get in touch with Sinatra. Time grows short. 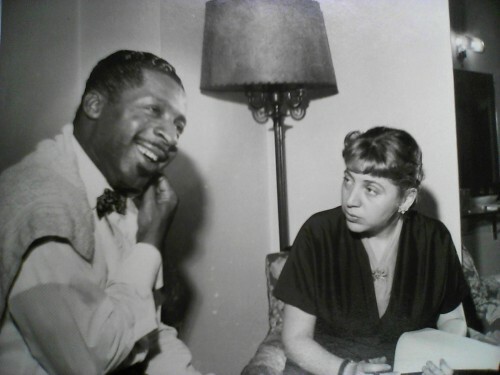 We commonly recognize Martha Glaser as the manager who staunchly defended Erroll Garner against the challenging business culture of the music industry. Her job was to make his life as bearable and enjoyable as possible. And in this regard, she often succeeded. Through an analysis of their correspondence with one another, we learn that Glaser possessed qualities that separated her from other music managers of her time. She was humorous, fun-loving, and playful. Yet she could also be firm, uncompromising, and tough. Nobody can deny, however, her passion for Garner’s well-being and success. For this blog post, I would like to discuss three sides of Glaser that are evident in her direct correspondences with Garner: Martha the adviser, Martha the encourager, and Martha the enforcer. The impetus for her comments was likely the recent success of “Misty,” which he wrote in 1954. She obviously believed that he could cement his legacy as a composer by featuring his original compositions more regularly. Though Garner had been established for some years, Glaser deemed it important early in their relationship to build his confidence by emphasizing his talent as a performer and composer. It should be noted, however, that many of her later letters in the archive were more formal and did not possess the same starstruck quality. Garner did not always respond favorably to Glaser’s comments, as indicated by Glaser’s comments in another letter: “I am as concerned about your career, and about you, as I ever was—only now I try to dispatch my work with a little less ‘mothering’ which seemed to bug you…” Despite the occasional tussles, one could argue that all of Glaser’s qualities—as adviser, encourager, and enforcer—were necessary for maintaining a successful client-manager relationship. In the end, the longevity of their relationship seems to attest to this argument.